Sometimes we plan our garden experiments months, or even a year, in advance, and then sometimes we just wing it at the last minute or even a little late. The latter is the case with this pot of okra. I didn’t even think about it until I saw okra in the grocery store in late May and thought, “We should make some smothered okra!” After Builder Guy and I made it together, I thought, “We should plant some okra!” And of course by then I couldn’t find any seeds or a single plant in any nearby nursery or garden center. Technically by mid-June it’s pretty late for starting okra from seed. Then while visiting my parents in South Carolina, we ran across some okra plants at Wal-Mart. Sold! And of course since we didn’t have a space set aside for them in the garden, we decided to put them in a pot and see what would happen. They looked a little unhappy for the first couple days, but now they are big and healthy and producing okra. 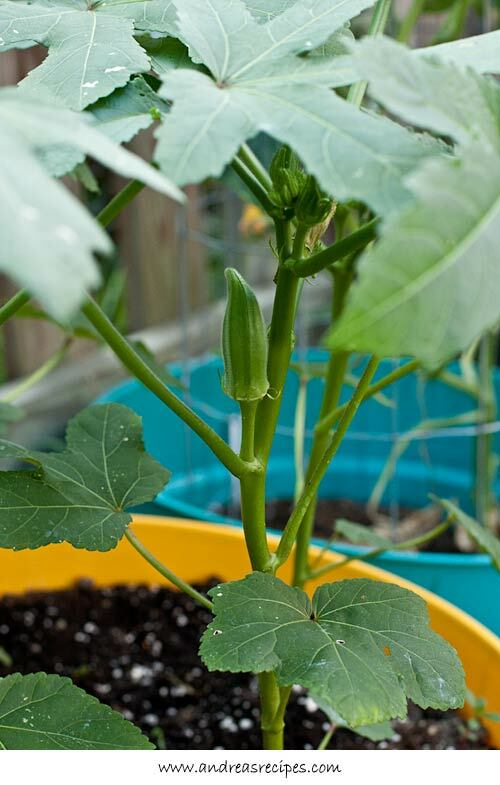 Okra is actually a relative of hibiscus and hollyhocks, and they produce beautiful whitish blossoms with deep red at the base, which only last for a day. Then they droop and produce fruit if pollenated. Our okra plants are apparently blooming in secret because I’ve tried for days to get photos of okra blossoms and haven’t seen a single one. But there’s still okra coming, so maybe I’ll get lucky and get a photo at some point this summer. The variety we have is Clemson Spineless, a favorite for its flavor as well as being a prolific producer. Harvest can generally begin 56 days from seeding, and fruits should be picked when they are about 3 inches long, otherwise they will become tough. Plants will continue to produce all the way to frost if you keep them picked. 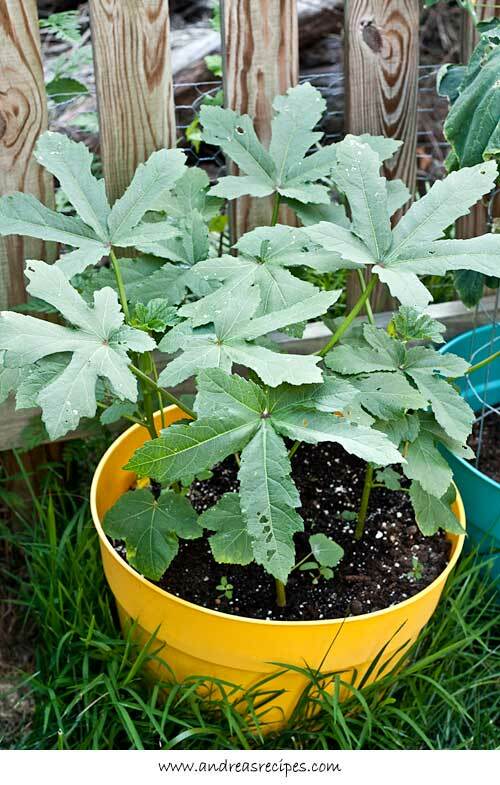 I’ve never grown okra, but I’m thinking it would be fun! I love okra and can’t imagine a summer garden without it. Have been trying a new thing, too, in planting some of my vegetables in the front yard gardens! My neighbors think I’m overstepping the line a bit, but I don’t care. That’s why I chose a home without a Homeowner’s Association to tell me which way my grass has to grow. Enjoy and come visit when you can. Thanks Tracey! Like I said, this is an experiment, so we’ll see how much okra we actually get. Hi Kalyn! I thought okra would something fun to try, and so far so good. Hi Natalie. I think okra is fun to grow! This is our first year growing okra, and we’re very pleased with how it’s doing. It’s going to get a permanent spot in the garden from now on.